What Can a Proposal Generation Tool Do for You? Imagine that you are a sales manager. You are gazing out through the glass windows of your plush office across the vast expanse of desks where your sales force performs their in-office tasks. Being a good manager, you periodically get out from behind your desk and walk around just to see what everyone is up to. Out on the floor, you notice that many desks are empty. That’s a good sign, you think to yourself. Those guys are out selling. You also hear the drone of multiple phone conversations in progress emanating from the reps you see hunched over the phones on their desks. Again, good to see; reps making calls and connecting with customers and prospects! What a team! The next day you notice the same reps are still there and still working on proposals. You ask about when the presentation will take place, and you learn that it is still several days away. You start keeping track, and several weeks later you realise that you have a major productivity bleeder happening right there before your eyes. Your sales reps – your most expensive human assets – are spending days each month doing clerical work. To make matters worse, they aren’t doing a particularly good job of it. Bad graphics, misspelled copy, over-produced PowerPoint presentations, misinterpretation of company-vision and mission information, pricing errors and inconsistent formatting are all typical features in the presentations that are coming out of your sales operation. And at three days a pop, they are hideously expensive – three days of lost opportunity, lost prospecting, lost nurturing and lost time. 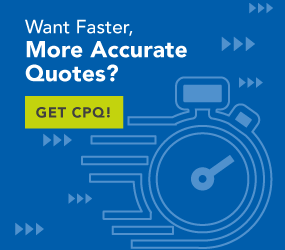 Quotation management software helps your sales force by facilitating accurate quotations, and configuration software assures your reps that they are building correct product configurations. A good proposal generation tool assimilates the pricing and configuration data into a professional-looking proposal document designed around your corporate specifications and guidelines. Rather than building a sales proposal from scratch every time, the rep invokes a generate proposal function within the Configure Price Quote (CPQ) system. All of that data and text, relevant customer stories, product information and corporate information are pulled into a finished, high-quality, automatically generated proposal. The good news just keeps on coming. You don’t have to purchase this functionality separately and integrate it, there are CPQ tools that provide all of it in a single integrated solution. CPQ technology does it all. The rep and the customer discuss the pains and needs affecting the customer’s situation. This information is input into the CPQ system. As the information accumulates, specific product recommendations are made. As the products are selected, the BOM is built, and the pricing is invoked and rolled up into a quotation sheet format. Finally, once the product and pricing are largely agreed upon, the rep can request that a proposal be produced. Again, variable information is requested and automatically input into the document, CRM is queried for company information, applicable customer stories are selected and product collateral is formatted and incorporated into the proposal output. The product listing and requisite pricing are produced in a format that is consistent with the market being served. The final product is a professional-looking proposal that communicates all of the right information about the solution, the pricing and the vendor company. The process is completed in a few minutes instead of a few days, and sales reps can stick with selling and forget about proposal-building.